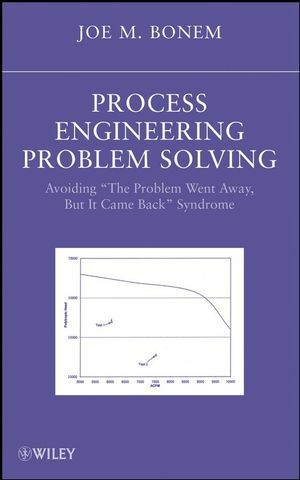 Avoid wasting time and money on recurring plant process problems by applying the practical, five-step solution in Process Engineering Problem Solving: Avoiding "The Problem Went Away, but it Came Back" Syndrome. Combine cause and effect problem solving with the formulation of theoretically correct working hypotheses and find a structural and pragmatic way to solve real-world issues that tend to be chronic or that require an engineering analysis. Utilize the fundamentals of chemical engineering to develop technically correct working hypotheses that are key to successful problem solving. Joe M. Bonem has drawn on more than forty years of experience to write this book. He worked more than thirty years in polymer manufacturing and process development with Exxon Chemical and was a consultant for over ten years. He has taught numerous short courses in plant problem solving to both process engineers and process operators. Chapter 2: Limitations to Plant Problem Solving. Chapter 3: Successful Plant Problem Solving. Chapter 4: Examples of Plant Problem Solving. Chapter 5: Formulation of Working Hypotheses. Chapter 6: Application to Prime Movers. Chapter 8: Application to Kinetically Limited Processes. Chapter 9: Application to Unsteady State. Chapter 10: Verification of Data. Chapter 11: Successful Plant Tests. Chapter 12: Utilization of Manual Computations. Chapter 13: Putting it altogether.